Watch long-extinct creatures spring to life in a striking first pop-up book for budding paleontologists. Showcased are fifteen dinosaurs and prehistoric reptiles, from Ankylosaurus to Velociraptor, each one accompanied by its name and pronunciation. 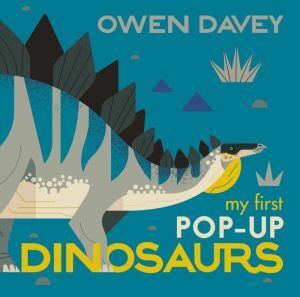 At once simple and sophisticated, Owen Davey’s striking pop-ups, with their geometric patterns of spiky scales, dramatic splotches, and dotted feathers, are sure to mesmerize dinosaur aficionados of all ages.